During the winter of 1988, my husband and I thought it would be a fun weekend trip to visit Quebec City’s winter carnival and stay at the luxury hotel Le Chateau Frontenac. My 16-year-old daughter, Liza, wanted to bring her friend Mel. So, off we went, making the journey from Bangor to the Jackman border crossing in our brand-new Saab. Elaine Ayer is a resident of Portland. 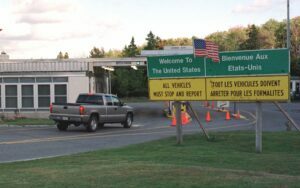 Upon arrival, the Canadian border agents asked us to pull into the garage, where they separated us and began questioning us about who we were, why we were coming to Canada, etc. I suppose the fact that we had two young girls in the backseat (one a blonde and the other a redhead, with “big hair” and leather motorcycle jackets) piqued their interest. They began to search our luggage and then took out the backseat of the car! Needless to say, we were worried and perplexed. The border agent then advised us that my daughter had several “joints” hidden in the lining of her jacket. They confiscated the contraband and sent us on our way, chuckling that if we had been crossing into the U.S., we would have had our car confiscated because of the new zero-tolerance law! They also told the girls that they would never again be allowed to enter Canada, a scare tactic that proved to be untrue. Years later, at Mel’s baby shower, we were all asked to share a memory about her. Over the years, the story has been repeated many times and, depending on the audience, has grown funnier with each telling.